Enter an address and obtain property related information. Click to access the City's eMaps. The Zoning By-law reflects amendments up to January 2019. Full Screen and Mobile Friendly Once you have the city-wide map loaded, click on the appropriate zone area. This will display a link to a PDF document that will allow you to further determine your zoning. 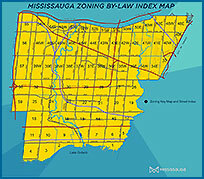 Important: The Zoning By-law Index Map is best viewed in Chrome, Internet Explorer 10 and higher, Mozilla Firefox or Safari, otherwise you may have trouble displaying the map properly. Once you have determined the zoning of the property, click on the corresponding Section of the Zoning By–law in the table below. How This By-laws Works (pdf) (105 KB) provides a brief introduction to the Zoning By–law. The online version of Zoning By-law 0225-2007 is provided for convenience purposes only as it may not reflect recently approved amendments. It should not be relied on when making decisions in connection with real estate transactions, development proposals or building permits. Please visit the Mississauga Civic Centre, Planning and Building Customer Services Centre, 3rd floor, between 8:30 a.m. and 4:30 p.m. to review the Official Zoning By-law and to speak with staff before making important decisions. Copies of Zoning By-law Amendments are available from the Office of the City Clerk, Corporate Services Department, 2nd Floor, or call us using the "Contact Us" information on the left side of this web page. Questions? See "Contact Us" for options. 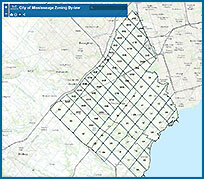 List of Unconsolidated Zoning By-law Amendments. This is a list of zoning by-law amendments passed by Council but not yet included in the online version of the Zoning By-law due to the status of the amendments. Click on this link for further information prior to reviewing the online version of the Zoning By-law below. This document is best viewed using Chrome, or Internet Explorer 10, or higher.